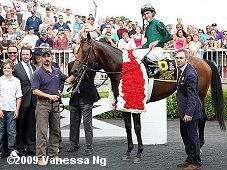 Shane Ryan, the President of Castleton Lyons, leads Gio Ponti to the winner's circle after the 2009 Arlington Million. 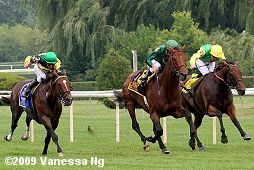 The $1 million Arlington Million Stakes (G1) celebrated its 27th renewal on Saturday afternoon at Arlington Park near Chicago. A field of 8 older horses went to post in this 1 1/4 mile turf feature, with Gio Ponti sent off as the 3-2 favorite, coming off three straight Grade 1 victories, the Frank Kilroe Mile at Santa Anita followed by the Manhattan Handicap and the Man O'War Handicap at Belmont Park. 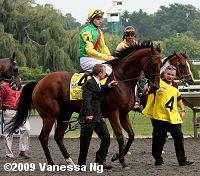 In to challenge him included 3-1 second choice Einstein, winner of the Santa Anita Handicap and the Woodford Reserve Turf Classic but third in the Stephen Foster at Churchill last time out, and 5-1 third choice Presious Passion, winner of the Monmouth Stakes and the United Nations Stakes, both at Monmouth Park. Gio Ponti leads down the stretch with Stotsfold on the inside and Just as Well closing on the outside. As expected, jockey Elvis Trujillo sent Presious Passion to a clear lead, opening up by as many as 10 lengths through fractions of 23.98, 48.44, and 1:14.23 over the good turf course. 11-1 Gloria de Campeao sat alone in second for the first 3/4 mile. On the turn, Presious Passion and Gloria de Campeao both tired, as Gio Ponti, who sat back in sixth early after stumbling at the start, came out four wide to take over the lead with 3/8 to go. Gio Ponti opened up a 4 length advantage at the 1/4 pole through a mile in 1:39.58, and easily held off late-running 19-1 Just As Well by 1 1/4 length at the line, completing the distance in 2:04.19. It was just a head back to 29-1 longest shot Stotsfold third. 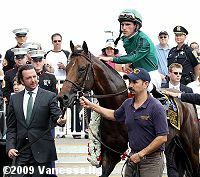 Left: Gio Ponti in the winner's circle. 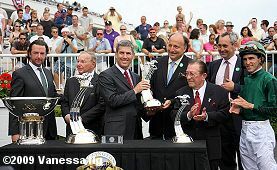 Right: The trophy presentation with trainer Christophe Clement in the center accepting the trophy and Shane Ryan, the President of Castleton Lyons which owns him, on the far left. Clement said, "At the end of the day, we were very patient with him when he was a 3-year-old and he keeps maturing and is a better 4-year-old. As far as Presious Passion, I told Ramon not to worry about him. 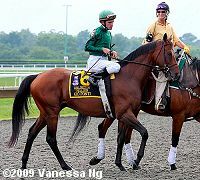 If you look at him, his best races were at Gulfstream and Monmouth, two speed-favoring courses. Today with the rain, it was not that speed favoring going in. There are many good races around and he could go in any one of them. Let's just enjoy today." Left: Gio Ponti in the post parade. 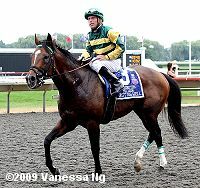 His jockey Ramon Dominguez said, "He's a great horse. He just does everything so easy. I was a little concerned with the way the turf was playing all day. He stumbled a little bit out of the gate and I thought it would compromise my chances but right he away he came back up and was on the bridle, taking me every step of the way. Christophe was confident and told me to just do whatever I wanted. If we could lay a little closer, that would be great because I didn't want to have to make up any more ground. He's a pleasure to ride. Once we got to the top of the lane and he had a target in front of him, I encouraged him and he responded." 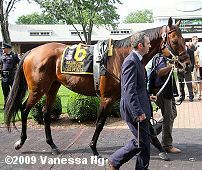 Right: Gio Ponti in the paddock before the race. Left: Second place finisher Just as Well returns after the race. His trainer Jonathan Sheppard said, "I was thrilled with the way our horse ran. I was concerned about the ground, you didn't see too many horses closing earlier. I told E.T. to ignore Presious Passion. 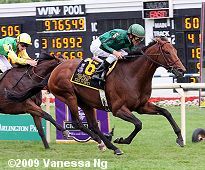 He was tracking (Gio Ponti) around the last turn but then Einstein weakened and dropped in front of him, which broke his stride slightly. I'm not saying he would have won, but he would have made it closer." His jockey E.T. Baird added, "Today Jonathan wanted to keep him a little bit closer only because of the yielding turf and we didn't think he'd be able to make up that much ground. Because we tried to keep him in the main flight of horses and it worked out pretty well. I thought I could catch the winner if he collapsed or gave in a little. My horse was hanging in there pretty strong. He wasn't giving up." Right: Third place finisher Stotsfold in the post parade. His jockey Adam Kirby said, "Everything went well. The horse ran really well and traveled around well. I thought when they straighten up (in the stretch) I thought he was going to win. He every right to be here and thought he was overpriced. I am very pleased he ran well."